Directed by Wayne Yip (who also directed the previous ep The Lie Of The Land) and written by Mark Gatiss. Also the return of Alpha Centauri, voiced by the original actor Ysanne Churchman, brought out of retirement (she's 92!) and the Galactic Federation from the Peladon stories. I may be biased but I thought this was the best ep this season (and baring last week, it's been a v strong season), may be even Capaldi's best so far. This was a good episode, but Capaldi's best ? That's still Heaven Sent for me. 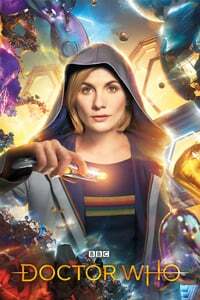 I felt like it was nothing special, except for the fact that it could easily have been dropped into any era Doctor Who with no script changes except the movie references. It was so classic Who that I wanted the effects to be cheesier! It was a pretty good episode, but damned if I can figure out how much difference having the Doctor in it made. It struck me as merely a set up for getting Missy out of the vault at the end, while the British army battled, and finally made peace with, the Ice Warriors. About the only thing the Doctor had a real "only the Doctor can do this" moment was sending out the signal for the Ice Warriors. Other than that, he just did a lot of pleading for peace. - What were the Doctor and Bill doing at NASA to begin with? - Why did the TARDIS automatically travel back to the university with Nardal? Did Missy somehow have some sort of control over it from the friendly confines of the vault? I can't imagine how. - It (his screwdriver) still won't work on wood. True. But I bet it could have done a major job on all the metal rods holding that jail door together. About the only thing the Doctor had a real "only the Doctor can do this" moment was sending out the signal for the Ice Warriors. I'm pretty ok with that. It makes the Doctor less of a superhero which is something this show needs. I haven't watched a ton of the old series, but this did feel like a classic episode with modern pacing. That's not something I would want every week, but for a monster-of-the-week filler episode it was quite good. I really want that gun that turns people into basically rubber balls. b) I was so convinced that the actress playing the Ice Queen was secretly Joanna Lumley, despite the fact that there's no way Joanna Lumley takes a job involving hours of makeup and a rubber lizard suit unless it suits her fancy, that I had to pause it at the 30m mark and consult IMDB. The actress credited for the Ice Queen has only one other credit to her name and no photos, and since I haven't seen her on "The Bill," I remain convinced that that's, like, Joanna Lumley's secret identity for taking jobs just for funsies. I mean, she's been the Doctor, she could be trying for a hat trick (villain, companion)! Until you show me Joanna Lumley and Adele Lynch in the same room together, I am going to stick with my theory. What was the music that was playing (i suppose in the doctor's head) when he saw Missy? It's a clue but i cannot place it. I really enjoyed this but I wondered how they could do without the TARDIS's translation services. Isn't that still the in-show explanation for everyone speaking English? Don't recognize the music although it does kind of sound familiar. And so sad! I hated last week and now all is forgiven. That's the programme. Two things would have improved matters: The Doctor singing "Haroon, haroon, haroon"; Roseanne Barr being the Queen. Otherwise, no complaints at all. I liked the way many things were left unsaid. I would play a game where the entire gameplay is you killing enemies with this gun and then using their rubberball bodies to solve puzzles. I don't even need a story. The voicing of the Ice Warrior Queen reminded me greatly of the Empress of the Racnoss from way back in The Runaway Bride. Given the episode title and Missy convincing Nardole to let her out, I guessed at one point that Missy would end up as the Empress of Mars. That weapon freaked everyone in my house out! You go from human to black-hole-compressed? You are crunched into a cube like a car in a junkyard? You tell your heartfelt story about your hopes and dreams and then you are just a bouncing blunt-edged box of meaty muppet parts? Aaaaaagh! That weapon freaked everyone in my house out! Yeah, that weapon was probably one of the best they've had on the show. Totally unexpected and really effective in a "holy crap!" kind of way. Very original. They'd make nifty ottomans, don't you think? Next time my kids go to a bouncy castle there's going have to be a minute's silence first. I spent the episode waiting for the massacre, and subsequent reveal that the "God save the Queen" message was made out of compressed soldiers.